Definitely one of our more popular mid-week packages, the San Francisco Photo Tour provides you with the opportunity to see some of the famous sites in the City while we take amazing photos of you both! We provide comfortable transportation and would be thrilled to take you to the iconic landmarks of your choice. The Palace of Fine Arts, the Golden Gate Bridge, and the Legion of Honor are just a few of the sites available to see on your SF photo tour. 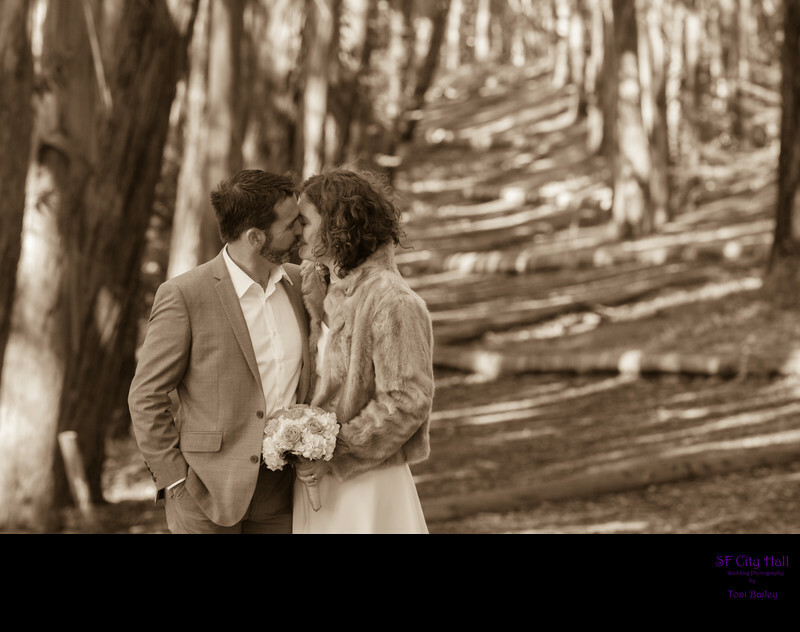 Most of our couples choose our "San Francisco" Package which includes 4 hours of total coverage and enough time to visit 3 additional locations after we depart from City Hall. We make this a fun tour without running from place to place. Want to stop in to a neighborhood bar? No problem and we will even catch a few moments sitting at the bar with a fun photo! We recently took one of our Australian couples to the famous Buena Vista Cafe and walked in to thunderous applause as the patrons noticed our dressed up bride. This is a memory they will have forever! That's what this tour is all about - memories and not just photography. Please scroll down on this page to see a few samples of San Francisco Photo Tour images. If you want to experience even more of the city and book a longer tour, just let us know. Custom packages are available. To view the details of this City Tour package, please click Info - Prices and Services. The photo above is one of our locations for the San Francisco City Tour package. This is the view of the Golden Gate Bridge from the 17th hole of Lincoln Park Golf Course. It's very close to the Legion of Honor, so we often take our couples to both locations. Nick and Ashley are shown here toasting with champagne shortly after getting married at San Francisco city hall. 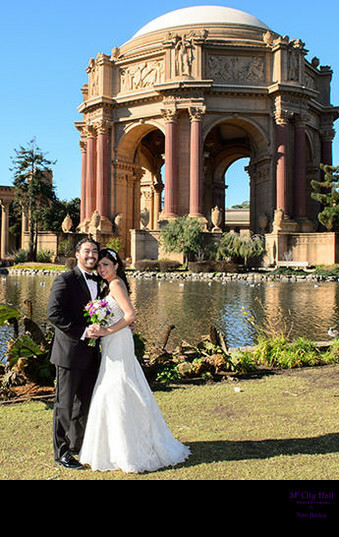 The Palace of Fine Arts (shown above) is definitely one of our most requested locations in San Francisco. 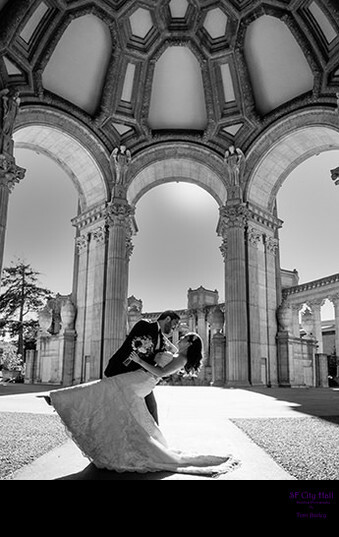 When we take our couples there for the San Francisco City Hall Photo Tour, we shoot some of our photos in front by the pond to get the view you see above. We will also walk around to the back and go inside the Rotunda itself and around the grounds. There are usually quite a few San Francisco tourists milling about, but we always manage to create some beautiful images without people in the background! We love taking our couples to Ghirardelli Square! There are so many fun things to do there and it becomes more of a walking tour with occasional stops for photographs. As you can see above, it's a great place to get a Cable Car shot, but so much more! Street photography, the water, and the Ghirardelli Square sign are just a few examples of the types of shots we get. We often end the tour by taking the newly married couple to the famous Buena Vista Cafe for an Irish Coffee. Another popular stop on our San Francisco tour is the Legion of Honor. This amazing location is famous for it's beautiful gray columns (see above). 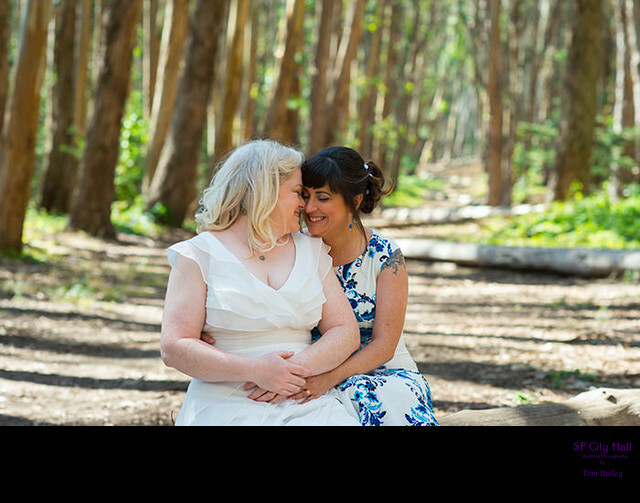 It's a fun place to bring some of your wedding guests for family photos and there is even a view of the Golden Gate bridge right across the street. Not as touristy as some San Francisco locations, it's another favorite! 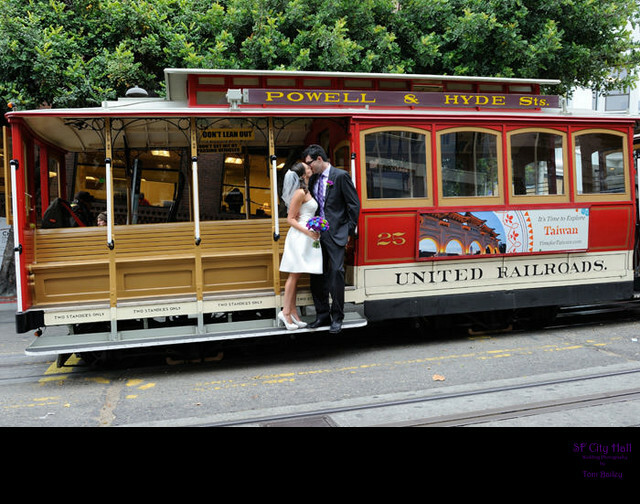 Some of our couples enjoy "Street Photography" in any of the famous San Francisco Districts. 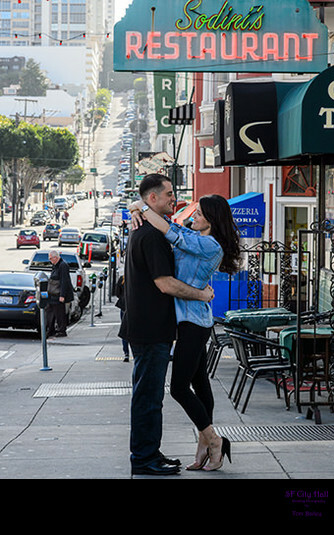 The above photo on the left was actually an engagement session before the couple's San Francisco wedding and it was shot in the North Beach area. This neighborhood holds special meaning to Bobby and Jayne because they are both Italian and love spending time here. On the right is a photo from a walk through San Francisco's Financial District. The couple wanted it to look natural with cars and people in the background. 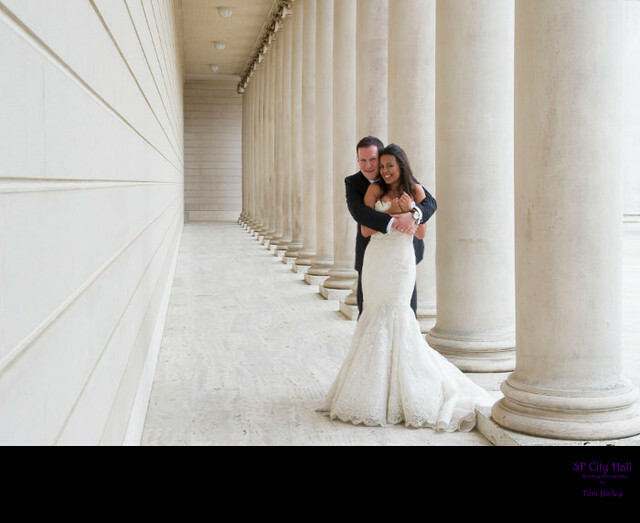 These photographs really give you a feel for the city and can be part of your SF Photo Tour after your City Hall Wedding. 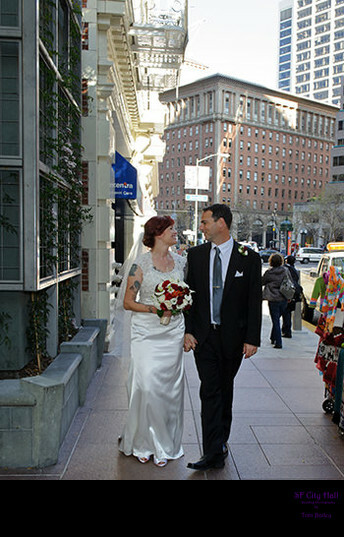 Return to San Francisco City Hall Wedding Photography Home page.